How should we understand the personal and social impacts of complex mobility systems? Can lifestyles based around intensive travel, transport and tourism be maintained in the 21st century? What possibility post-carbon lifestyles? In this provocative study of "life on the move", Anthony Elliott and John Urry explore how complex mobility systems are transforming everyday, ordinary lives. 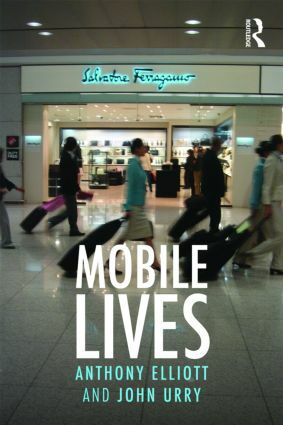 The authors develop their arguments through an analysis of various sectors of mobile lives: networks, new digital technologies, consumerism, the lifestyles of ‘globals’, and intimate relationships at-a-distance. Elliott and Urry introduce a range of new concepts – miniaturized mobilities, affect storage, network capital, meetingness, neighbourhood lives, portable personhood, ambient place, globals – to capture the specific ways in which mobility systems intersect with mobile lives. This book represents a novel approach in "post-carbon" social theory. It will be essential reading for advanced undergraduate students, postgraduates and teachers in sociology, social theory, politics, geography, international relations, cultural studies, and economics and business studies. Mobile lives: A step too far?